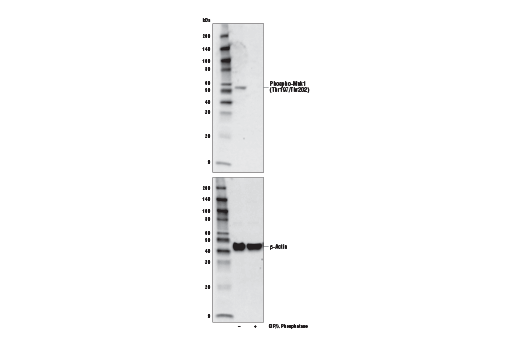 Western blot analysis of extracts from HeLa cells, untreated (-) or treated (+) with calf intestinal alkaline phosphatase (CIP)/λ phosphatase, using Phospho-Mnk1 (Thr197/Thr202) Antibody (upper) or β-Actin (D6A8) Rabbit mAb #8457 (lower). Phospho-Mnk1 (Thr197/Thr202) Antibody recognizes endogenous levels of Mnk1 protein only when phosphorylated at Thr197 and Thr202. Polyclonal antibodies are produced by immunizing animals with a synthetic phosphopeptide corresponding to residues surrounding Thr250 and Thr255 of human Mnk1 protein. These two residues correspond to residues Thr197 and Thr202 of a shorter mouse Mnk1 (Waskiewicz, A. J. et al. (1997) EMBO J. 16, 1909-1920). Antibodies are purified by protein A and peptide affinity chromatography. Eukaryotic initiation factor 4E (eIF4E) binds to the mRNA cap structure to mediate the initiation of translation (1,2). eIF4E interacts with eIF4G, a scaffold protein that promotes assembly of eIF4E and eIF4A into the eIF4F complex (2). eIF4B is thought to assist the eIF4F complex in translation initiation. Upon activation by mitogenic and/or stress stimuli mediated by Erk and p38 MAPK, Mnk1 phosphorylates eIF4E at Ser209 in vivo (3,4). Two Erk and p38 MAPK phosphorylation sites in mouse Mnk1 (Thr197 and Thr202) are essential for Mnk1 kinase activity (3). The carboxy-terminal region of eIF4G also contains serum-stimulated phosphorylation sites, including Ser1108, Ser1148, and Ser1192 (5). Phosphorylation at these sites is blocked by the PI3 kinase inhibitor LY294002 and by the FRAP/mTOR inhibitor rapamycin. Sonenberg, N. et al. (1978) Proc. Natl. Acad. Sci. USA 75, 4843-47. Gingras, A.C. et al. (1999) Annu. Rev. Biochem. 68, 913-63. Waskiewicz, A. et al. (1999) Mol. Cell. Biol. 19, 1871-80. Pyronnet, S. et al. (1999) EMBO J. 18, 270-9. Raught, B. et al. (2000) EMBO J. 19, 434-44. Our European office is closed in observance of Easter. We will reopen on Tuesday, March 23rd.